I love love love ramen. Unfortunately I do not get to eat it enough, mainly because the husband isn’t a huge fan. This is apparently due to the mess he makes when he eats it… but don’t we all get it all over our chops when we devour a bowl of steaming noodles!? I had been craving chicken noodles for weeks, but like proper stock from scratch kind of noodles. So when I had a free Sunday to myself I decided to give it a go! And I don’t mean to blow my own trumpet but these noodles are damn good. 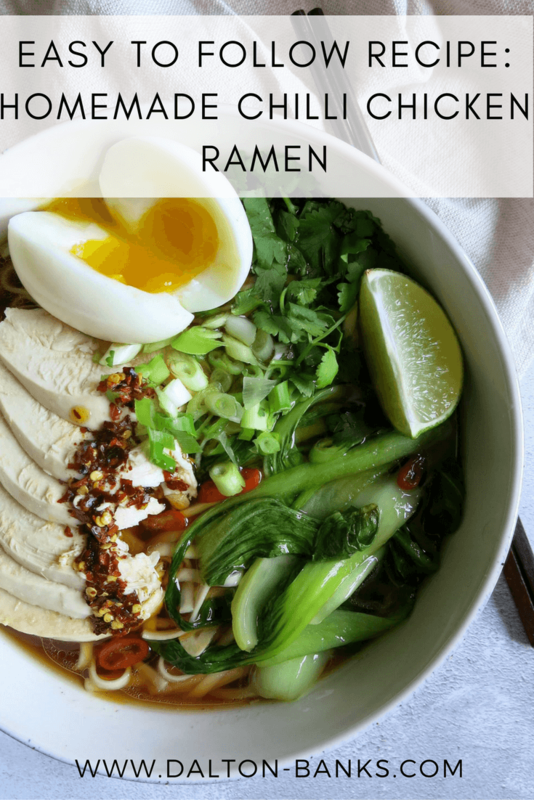 I’m not saying its an authentic ramen recipe, but it’s definitely inspired by bowls of ramen I have slurped up around London. I had remembered my brother making a noodle soup with stock used after boiling a whole chicken. After a quick telephone call we tried to piece together a recipe as he couldn’t completely remember the process. Notes made, I got going in the kitchen! 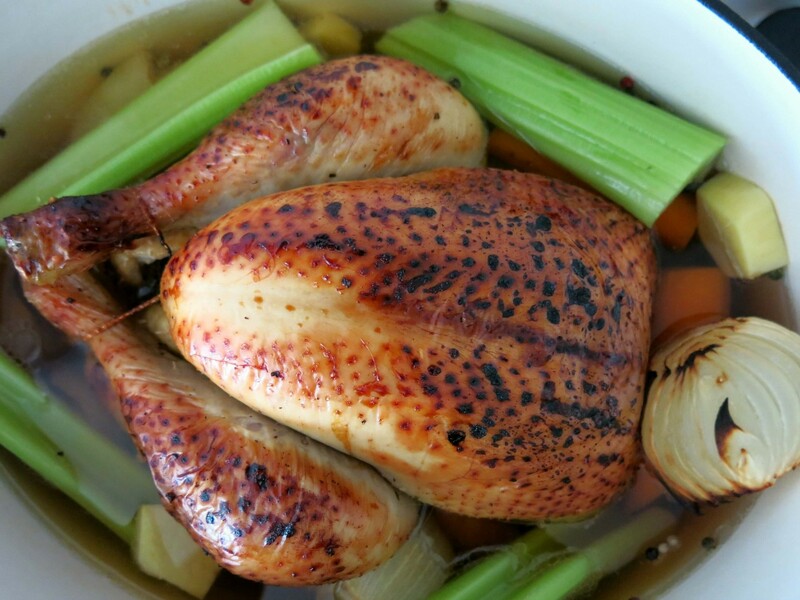 You roast the chicken on high first to crisp up the skin, not that you will eat the skin but because it adds a depth of flavour to the stock you later make. 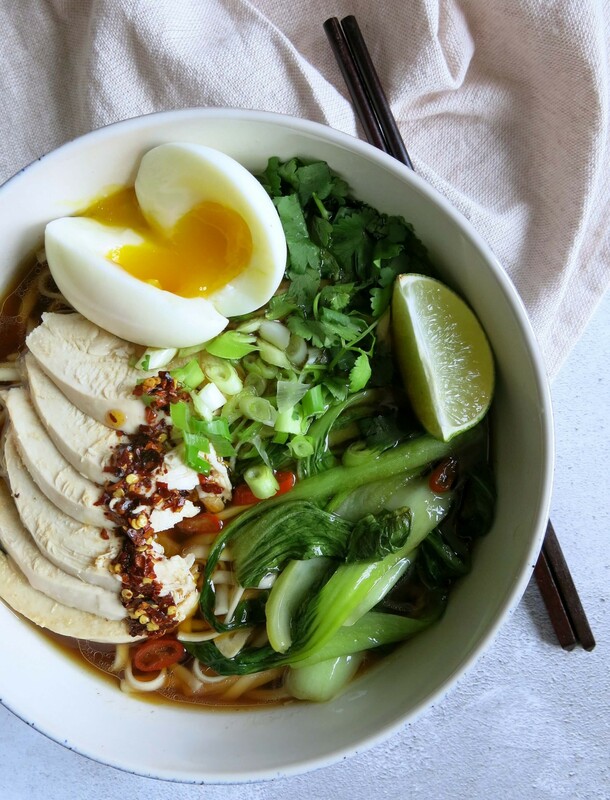 Then by boiling the chicken whole you are creating stock whilst also cooking a beautifully juicy chicken to eat with your ramen with enough left over for other delights. This is definitely a leisurely weekend recipe as it does take a couple of hours from start to finish. But I find it a therapeutic process and so satisfying to make. Preheat the oven to 220˚C fan (240˚C normal oven). Mix the tablespoon of soy, teaspoon of honey and teaspoon of fish sauce together in a bowl. Place your chicken in a roasting dish and brush with soy/honey/fish sauce. Cut the leek in half and the onions in half. Cut the carrots in half lengthways, then cut in half. Place these vegetables around the chicken. Grind some pepper across the lot. Roast the chicken for 30 minutes. You want the skin to get a lovely dark colour. After 30 minutes, transfer the chicken to a deep casserole dish with lid. Also transfer the vegetables around the chicken. Use a little boiling water to de-glaze the roasting dish and add to the casserole dish. Then add the bay leaves, celery sticks cut in half, fresh ginger cut into ‘coins’, peppercorns, coriander stalks. Pour in 2.5 pints of cold water and bring to the boil. Once boiling you may notice some scum on the top of the stock, just use a spoon to skim this off. Reduce to a simmer and cook for 1 hour with the lid almost completely on, just leave a little gap. I do check once again for scum and will spoon this off during cooking. After an hour carefully take out the chicken and place to one side. Use a slotted spoon to take out the vegetables and discard them. Carefully pour the stock left in the pan through a sieve over a large bowl. And you have your delicious chicken stock! You can keep the stock in an airtight container for a few days in the fridge, or of course freeze it to use at a later date. Heat the coconut oil on a medium heat in a saucepan. Add the chilli and ginger and fry for a few minutes. Then add the garlic. Add the tablespoon of soy sauce to the pan and fry for a few more minutes – it will start to look a bit sticky. Add the stock to the pan. I use 4 ladles for 2 people. It depends how ‘soupy’ you want it! And bring to the boil. Then turn down to a simmer. Whilst your stock is simmering boil your eggs – I boil mine for 6.5 minutes as I don’t like the white runny but the yolk is still runny. And also cook your noodles. I boil them for 2 minutes under the cooking time stated. Otherwise you’ll over cook them later. Once the noodles are cooked drain and portion up into two bowls and leave to one side. 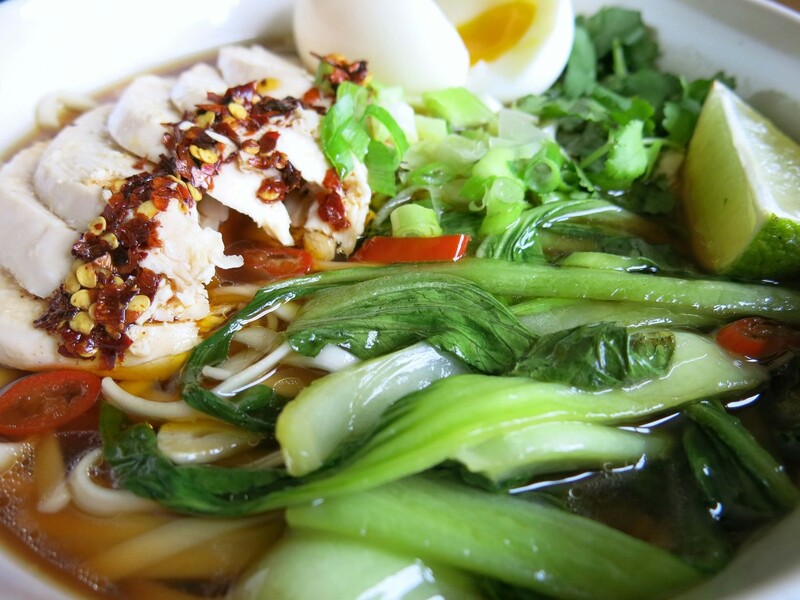 Once your eggs and noodles are on, add the pak choi to the stock. As soon as your egg is ready put them into a bowl of cold water so they cool enough for you to peel them. Use a ladle to pour the stock over the noodles, spooning the pak choi out carefully. Use a fork to tease apart the noodles in the bowls as they will have gone a little sticky. Add your sliced chicken, spring onions, roughly chopped coriander and halved egg to each bowl. I also drizzle over some chilli oil to add some extra spice. Serve immediately. Vicki this is amazing!!!! Thanks for sharing the recipe!